People like to laugh. People like people who like to laugh. People like people who have the ability to laugh at themselves. 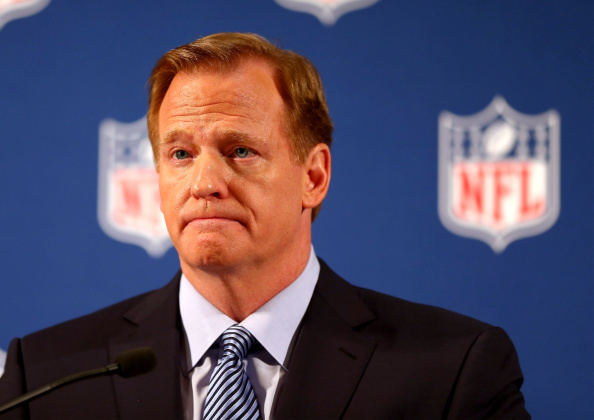 People do not like Roger Goodell. Funny or Die Sports executive producer Alex Richanbach was a panelist at SXSW in Austin, Texas and relays a remarkably absurd story about Roger Goodell and the NFL league office that is almost too good to be true. Almost, because of all the people and all the corporations in America, the NFL would be on the very short list of entities who could possibly be this removed from reality. According to Richanbach, the Funny or Die people discussed doing a video with Roger Goodell ala President Barack Obama, who had a very successful and influential appearance on Between Two Ferns with Zach Galifianakis. The league said no, only once they found out that GASP! there would be some jokes had at Roger Goodell’s expense. As Richanbach told it — I’m paraphrasing here — the NFL had some talking points that they wanted to cover during the taping, and they sent those over to FOD. This isn’t uncommon. Most people who would appear in a Funny Or Die video do so to promote a new TV show or movie, or in the case of Obama, a national health care marketplace. The NFL sent their notes over to FOD producers who responded by saying they’d be happy to address the talking points, but they wanted to make it clear that the comedy website would be making some jokes at the commissioner’s expense, obviously. So, the league responded by telling Funny or Die that they would not allow Roger Goodell to subject himself to ridicule from a comedian of all people. Professional football is a very serious business made of men with iron wills and stone faces and that starts from the top down. I wasn’t completely surprised to hear that the NFL didn’t understand how jokes work, but the next part was over-the-top, even by NFL standards. Is that not the most delusional, egomaniacal, most NFL thing ever? Here’s an easy way to finally get some good PR and show that Roger Goodell is actually a living, breathing human being with just an ounce of self-awareness and self-deprecating sense of humor… and the NFL said no, that’s not possible. Unreal. But this being the NFL, they couldn’t stop there. No, the league had to BACKHANDEDLY THROW THE PRESIDENT OF THE UNITED STATES UNDER THE BUS. The league couldn’t resist scoffing at the notion that Roger Goodell would dare lower himself to the level of the President of the United States. Yes, Barack Obama is the leader of the free world. Yes, he’s the most powerful man on the planet. Yes, he is the first African American president in our nation’s history. But… chortle… he’s not the commissioner of the NFL.